OCT. 13, 2015 — The old-fashioned, formal press releases of days past aren&apos;t always enough to grab the media&apos;s attention in these times of social media chatter and instantly shareable information, according to the entrepreneur who once led Gov. Jack Markell&apos;s public relations strategy. 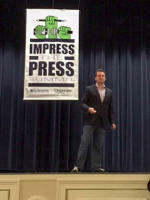 Businesses need to be conscious of the news media’s growing need for stories that have a unique approach, a personal angle and even a bit of fun, drama and conflict, keynote speaker Brian Selander told about 130 attendees at Dover Downs Hotel & Casino Tuesday at the “Impress the Press” summit on crafting better press releases. “You’ve got to think from the reporter’s mindset,” said Selander, who is Executive Vice President at Whistle Sports Network and one-time Chief Strategy Officer to Gov. Jack Markell. He urged the attendees to make it easier for overworked reporters to see how the story might fit into larger issues, or impact people’s lives. To do that, businesses must become more familiar with the relevant media outlets, the reporters who work in them, and the daily needs of both, tailoring their “news” to fit each platform. 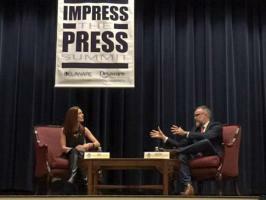 “Reporters have to ‘feed the beast’ 50-60 times a day,” and are open to all the help they can get when it comes to obtaining fresh, relevant content, Selander said. Often, that means making it as easy as possible for reporters to explain complex concepts quickly, and in a lively, personality-driven way, speakers agreed. Sponsored by the Delaware Economic Development Office and Delaware Tourism Office, the half-day summit also featured insider tips on press releases from local journalists and public relations experts, as well as a conversation with Dogfish Head Brewery’s Off-Centered Storyteller. The event was aimed at giving more businesses the tools needed to succeed, said Bernice Whaley, Director of the Delaware Economic Development Office. Linda Parkowski, Director of the Delaware Tourism Office, noted that it was a day of practical advice, offering a rare glimpse into the newsgathering process. As part of the seminar, Comcast Newsmakers’ Jill Horner had an in-depth one-on-one conversation with Justin Williams, Off-Centered Storyteller at Dogfish Head Craft Brewery in Milton, Del. Williams detailed some of the public relations strategies that Dogfish Head has used to create one of the largest and most loyal communities in the craft beer industry. “They are as hungry for content as anybody, so if you can give them a story that they will put right in, you’re going to win,” he said. In a special Media Panel that preceded the keynote address, three prominent Delaware journalists stressed that businesses need to keep their communications focused -- in terms of platform, message and audience. Often, that means tailoring and timing press releases with the needs of each media outlet in mind, the journalists said. Tim Furlong, on-air news reporter at NBC-10 television in Philadelphia, noted that firm daily deadlines and complicated logistics mean that television stations typically need more than a short notice about a newsworthy event. Phil Freedman, news director at delawareonline.com/The News Journal, noted that the typical top editor is deluged with releases, making it crucial to target the specific journalists that will respond most favorably. Keep the communication as brief as possible, with essential information mentioned prominently and immediately, the journalists said. Amy Cherry, assistant news director at WDEL Radio, stressed to attendees that in today&apos;s media environment, even radio stations demand visual content such as videos for their websites, and value press releases and sources that recognize those needs. Panelists repeatedly stressed that timing is crucial. Businesses that seek coverage must respond promptly to media requests for more information or interviews, they added. Members of the media who would like more information on either events or arrange an interview with one of the speakers can contact Eric Ruth at 302-672-6813 or eric.ruth@state.de.us for more information.